People often ask me what I think is the best place to take a cruise in the world. This is, of course, a difficult question to answer because there are so many great cruise spots. I certainly think that a cruise to Alaska should be on everyone’s list. I also think that a trip through the Panama Canal is a must-see. 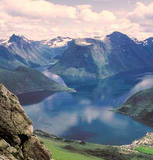 But if I only had one place I could visit on a cruise I would have to say it would be the fjords of Norway. There are probably more poetic ways to describe Norway’s jutting inner coastline, but to me they will always be known as “amazing”. As you pass along the rocky cliffs and you see the stunning mountain scenery coming into contact with the crystal blue water you’ll be amazed that such beauty can even exist. What makes this beauty even more special is the people who live amongst it. The inhabitants of the small towns in Norway know that they are blessed to live in such a stunning location and they are more than eager to protect it. They are also extraordinarily welcoming to guests. Indeed, a cruise through the fjords of Norway is on the top of my list and it should be on yours too, especially when you can find a great deal on an awesome cruise .